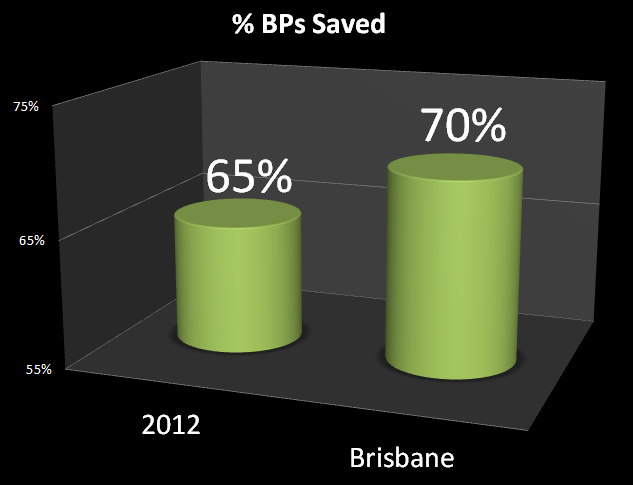 You are here: Home / Stats: Grigor Dimitrov’s Improved Serve in Brisbane – An Omen for a Huge 2013? 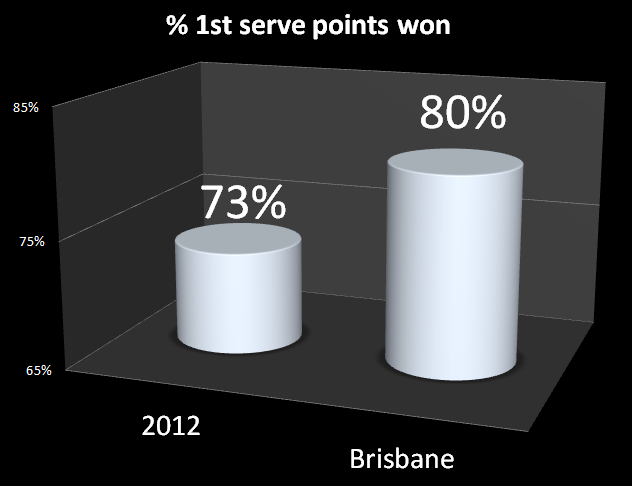 Stats: Grigor Dimitrov’s Improved Serve in Brisbane – An Omen for a Huge 2013? A few days ago, when Grigor Dimitrov beat Milos Raonic, the stat that was making the rounds was this: Dimitrov had managed to win all 26 points played on his first serve. What was my first reaction? Make fun of Milos Raonic, one of the worst returners of serve on the ATP. The Canadian is, after all, the man who failed to break Juan Mónaco’s serve over five sets at Roland Garros last year (think about that “feat” for a second. #neverforget). However, when Dimitrov rolled over Jürgen Melzer and lost just six of the 39 points played on his first serve – 85% – I started wondering if the Bulgarian’s incredible serving stats were not so much a result of facing poor returners, but of an improvement in his serve. As we know, Dimitrov edged past Baghdatis in the Brisbane semifinals (winning 79% of his 1st serve points), and lost his first ATP final against Andy Murray, even though he served for the first set and was up 4-2 in the second. Still, I thought it would be interesting to compare Dimitrov’s serving stats in Brisbane to what the Bulgarian did in 2012. How much did Dimitrov improve from last year? Thanks to the ATP’s wonderful Top 200 Matchfacts, I could focus on six serving stats: aces per match, percentage of first serves in, percentage of first serve points won, percentage of second serve points won, percentage of break points saved, and percentage of service games won. I also wondered what Dimitrov’s ranking was in these categories in 2012, and more importantly, where he would stand among his peers if he keeps up his Brisbane numbers throughout 2013. The results were quite interesting – and might foretell the kind of leap Dimitrov could make this year. This is a huge improvement, no? It’s noteworthy that Dimitrov hit 10 or more aces in four of his five matches in Brisbane (the high mark wasn’t reached against Raonic, but against Melzer: Dimitrov hit 17 aces past the former top 10er). The only match where he didn’t reach double digits was the final, where he faced arguably the second best returner in the world. He still managed to hit three aces past Murray, though. This is a huge leap. 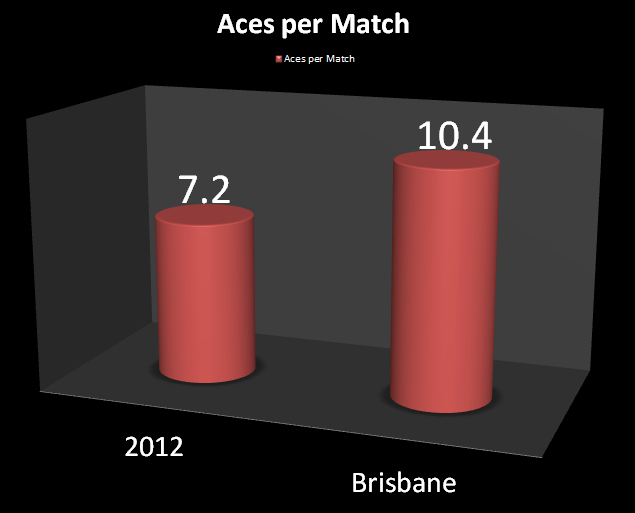 As a reference, Roger Federer hit an average of 8.3 aces per match in 2012. Naturally, this might be one of the toughest categories for Dimitrov to keep up with, as he plays more matches against better returners. Still, it shows what a great week the (alleged) boyfriend of Maria Sharapova just had. This stat was fascinating for a number of reasons: first, it was the one serving stat where Dimitrov didn’t compare favorably to his 2012 season. However, this was largely due to the Raonic match, where Dimitrov hit just 50% of first serves. In his other matches, his numbers ranged from 63% to 61%, for an average of 62%. What is interesting to me about this is that Dimitrov is essentially serving the same percentage of first serves as he did in 2012, but getting much better results from those first deliveries this year. He hasn’t lowered his percentage in search for more power, which can only be a great sign for him. Not much to say about this, other than it’s funny how his ranking in this category in 2012 mirrored his actual ATP rank of 48. You read that correctly. Grigor Dimitrov would be tied for the fourth-best percentage of first serve points won if his Brisbane numbers stay constant for the entire year. Naturally, they won’t – but if they stay in the vicinity of 80%, watch out. This is a modest improvement, but a significant improvement nonetheless. I was particularly impressed that Dimitrov managed to win 58% of second serve points in the final against Murray, who rarely wastes an opportunity to attack a second serve. See? Dimitrov is already ranked much higher than his actual ranking would suggest in this category – a solid foundation for the future, if you ask me. This is another significant leap, and it’s organically related to the dramatic improvement in Dimitrov’s first serve efficiency. If you’re feeling a lot better about your first serve, you will naturally be more confident when facing break points. From barely in the top 30 in this category last year to firmly in the top 10. Saving 70% of break points faced throughout a season is a daunting task, but if Dimitrov’s first serve keeps helping him out, this stat will at the very least improve from the 2012 benchmark. 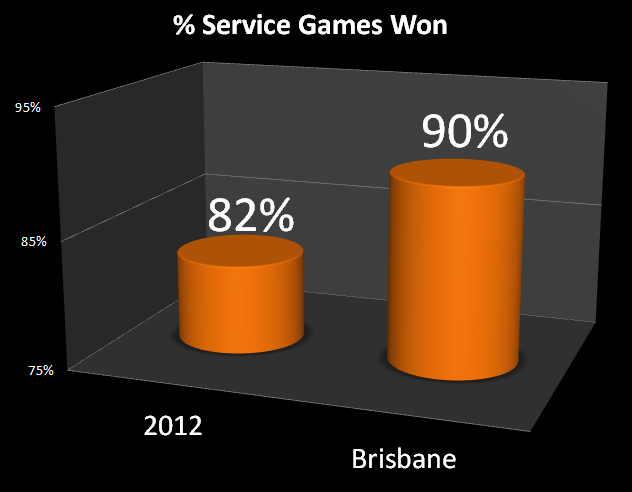 Yep – only four people in the world win 90% of their service games. Being in this group can’t possibly be a bad thing. Of course, this is rarefied air for Dimitov: the three people above him would be Milos Raonic (93%), John Isner (92%) and none other than Roger Federer (91%). It’s safe to say Dimitrov won’t keep winning nine out of 10 service games he plays, but again, if he stays around this mark, only good things can happen for him in 2013. So, what do you think changed for Grigor Dimitrov and his serve? A grip? A new racquet? Different strings? A tweak in his technique? More confidence? I saw very little of Dimitrov’s run, and haven’t seem him play all that much in the past to truly be able to figure out what has triggered this substantial improvement. Of course, it is possible that this was a one-off: there are instances in the past where someone served at a superior level during an event, only to fall back to their usual levels afterwards (Davydenko in Miami in 2008, Nadal at the 2010 US Open, Ljubicic whenever he played Vienna, etc), but it might just be that Grigor Dimitrov, at 21 years old, is finally making his move up the rankings. If that happens, you can rest assured that the rise will ride, at least partly, on what he continues to do with his serve. One thing to note though is that the Pat Rafter Arena is probably the one outdoor court on tour whose conditions mostly resemble those indoors. Always feel like I’m watching indoor tennis due to the partially closed roof. Obviously nicer conditions for serving than the average outdoor court. That’s really interesting to hear, Steve. There are some stadiums that are like that – the Shanghai main court comes to mind. It’ll be interesting to see what Dimitrov can do in a more hostile environment, something like the Auckland conditions that Janowicz had to endure a few hours ago. I actually know a thing or two about statistics, and while I don’t have my textbook with me at the moment, so I can’t perform an analysis of variance, I do know that Dimitrov played 43 matches in 2012, but only 5 so in Doha. This means the effect of noise on the data is about 3 times as big! (48% vs 15%) In other words be very careful about straight up comparing figures in such a case. I think it was pretty clear that the aim of the post was to point a few things out that *may* signal the start of a trend for Dimitrov, and that the sample size was tiny – after all, the title does have a question mark! I repeatedly mentioned that it’ll be quite difficult for him to keep up the level achieved in these five matches in Brisbane. There are no guarantees here – just a little case study about someone who *might* make a leap forward. It very well might turn out to be a one-off situation, aided by the favorable serving conditions mentioned by Steve above. This is a neat post, but, as you note several times, the sample size is extremely small, which means it’s hard to extrapolate much of anything from it. I’ve only seen Dimitrov play a few times, but I do remember he seemed to have a pretty big serve. It certainly seems possible that he’s made an adjustment that would make an already good serve better. One interesting thing that came up here was Nadal’s seemingly magical 2010 US Open serving improvement. I remember one of the questions in the 2011 season was: where did that pumped up serve go? Interestingly, I think the answer is that Djokovic took it away. During the off-season I was re-watching some of the 2011 finals from the Masters 1000s. When watching the Indian Wells final, one of the first things I noticed was the mph on Nadal’s first serve. He was regularly hitting upwards of 125 and getting to 130, which (even in the desert) I imagine is fairly rare for Nadal. In the first set it seemed to be working and he was winning a lot of free points, but in the second and third sets, both of which Nadal lost rather badly, his first serve percentage went way down. He was still hitting those big numbers, but the serve wasn’t going in, and you could actually see him losing confidence in the serve as the match wore on. It’s not much of a surprise that a few months later people were asking him why his serve wasn’t like it was during the US Open. In pressure situations he found it unsustainable. Anyway, long story short, the numbers above don’t point to Dimitrov making an unsustainable improvement, so perhaps, small sample size admitted, it does bode well for him in the future. I’m glad you liked it, Matt. Yes, the sample size is tiny: a little over a ninth of Dimitrov’s 2012 match total. We’ll see how Dimitrov’s serving continues – definitely something to track for the year. About the Nadal serve, that’s a very interesting point. I always thought that it was quite dangerous to let Nadal get into a serving groove, and that the key was to punish that second serve whenever possible. If Nadal starts feeling the pressure on the second serve, you can be assured that the speed on the first serve will drop almost immediately. And Djokovic’s great success in 2011 was based largely on the immense pressure he put on Nadal’s (and everyone else’s) second serves. It also doesn’t help Nadal that the serve is not a natural motion for him – being naturally right-handed. he also didn’t pull a Karlovic and serve for days on end. Also, he and Toni have been tweaking that serve almost every year. It’ll never be as reliable or fluid as a serve from someone who’s based their game on that one shot (like Karlovic) or built around it (like Federer). No one knows if this little Brisbane run will mean anything. Still, I still find it remarkable that even when Dimitrov had maybe the best service stats of his life, he still served around his usual 62% 1st serves. Might not mean anything in the long run, but it sure is interesting. Fernando says interesting analytic on a very intriguing player. 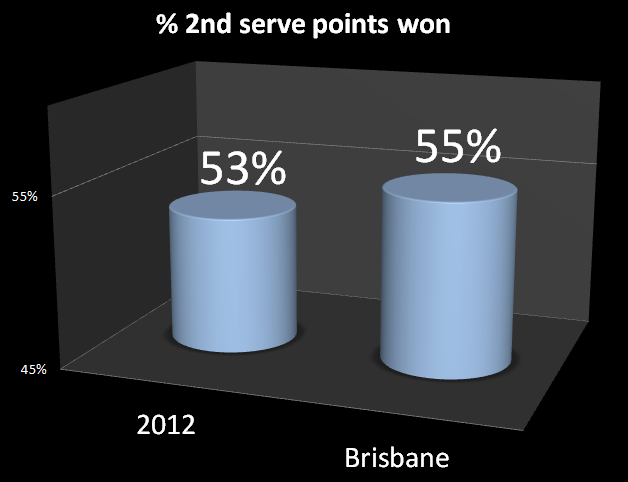 However, sometimes the stats on serving are a function of what the player does after the serve rather than the serve itself. Given how aggressive Grigor played, his unforced error total was not too bad. Fernando has never seen”Baby Maestro” play with such consistency throughout a tournament. And he did a very good job of taking his chances and changing direction on his forehands. Grigor actually did look like Maestro this tournament. But as you aptly state, the big question in whether this was a flash in the pan or real progress. So many times, we see players have a great tournament and then fade back into the pack. We shall see, no? I agree with the wise Fernando here, and I also think that in some respects, that’s also true about return statistics. The Humble Bull comes to mind. I do think that when you’re serving well, the other parts of your game are also clicking. It seems like for a lot of players, it all starts and ends with how that part of their game is working. And when it doesn’t, the cracks start showing up elsewhere, too. It might have been that Dimitrov felt extremely comfortable with his serve in Brisbane, and that translated into more composure and consistency on his groundstrokes. As we know now, this little run in Brisbane didn’t continue in Sydney. The Australian Open, particularly if Dimitrov receives a favorable draw, will be a huge test for this supposed improvement by Baby Maestro to continue.